Hey, guys! I know I’ve been slacking in blogging this month, but I have an excuse for it (a valid one). My parents have taken a holiday and I’ve been spending as much time with them as I could. I really cherish my family and spending time with them is the best thing I can do to show how grateful I am to have them. So, these past few weeks, I’ve been travelling with them, going to festivals and other conventions. 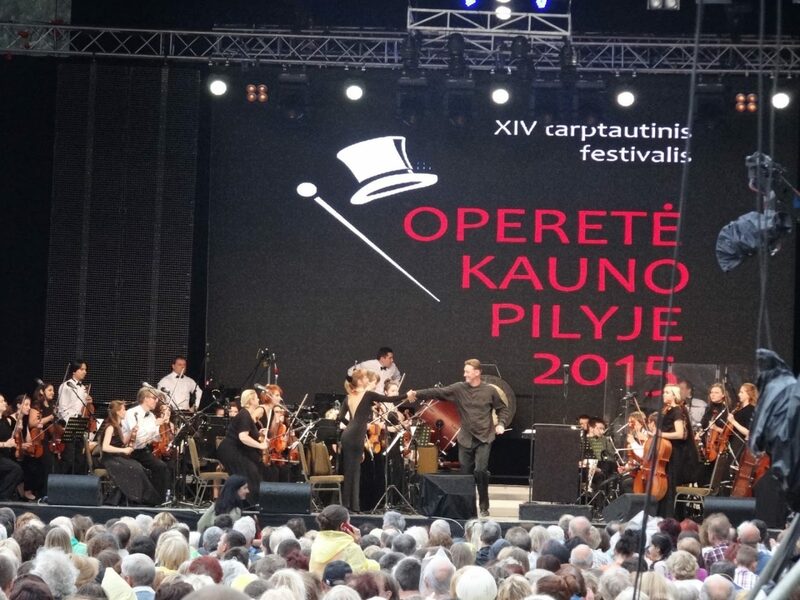 Today, I will share few moments with you too from the evening I spent with my mother at festival ‘Operetta in Kaunas Castle’. Firstly, we can’t go anywhere without food, so we took coffee to go and two muffins for each (they were delicious!!! Blueberry ones, niom niom). Then after grabbing a blanket we took off to the festival which was held near Kaunas Castle. We didn’t expect so many people to be there, but it was nice to see that so many people are into this kind of things and music. We listened to famous arias, operettas from operas all over the world. It was truly beautiful music and performances. The weather wasn’t so bad, it was raining from the start but soon it stopped which I was very happy about. Festival was at 6th of July. The day of Coronation of King Mindaugas (Lithuanian king) or in other words Statehood Day of Lithuania. On this day, we have a beautiful tradition for seven years now of singing our national anthem at 9 p.m sharp. So, all Lithuanians all over the world sing it at the same time. It’s so powerful and beautiful, you have no idea. To sing the anthem of my country with millions of people all over the world is something magical. You can feel the love for our country that is pulsing in every Lithuanian’s heart. Do you enjoy classic music? Have you got something alike this anthem singing in your country?